When Dorothy uttered her famous line about lions, tigers and bears in the “Wizard of Oz,” she may not have been thinking cute and cuddly. If she had a chance to check out the new, cute versions of the lions, tigers and bears you can pick as your elementary school mascots, she may not have only thought cute and cuddly, but she may have been ready to run over and give the cuddly critters a hug. 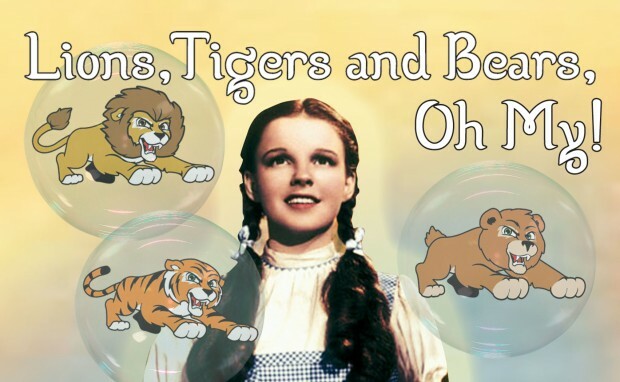 Even the Wicked Witch of the West would melt if she spied these adorable lions, tigers and bears you can use for your elementary school mascots. While the beasties may be adorable, they still bring the strength and character that has long made the three animals some of the most popular mascot choices ever. Lions: The lion Dorothy encountered on the Yellow Brick Road was lacking courage, but our adorable lion mascot has everything. His healthy mane, crisp gold coat and sprightly stance would make students proud to have him on their school T-shirts. Tigers: Dorothy didn’t pal around with a tiger on her Oz adventure, although our delightful tiger mascot would have made a fine companion indeed. He also makes a fine addition to elementary school shirts, with his striking striped coat, bold green eyes and a playful snarl on his mug. Bears: Dorothy would have swooned for our bear, a frisky and fun critter without a grizzly bone in his body. This bear is an enchanting choice for a mascot, looking oh-so-lovable on elementary school shirts. 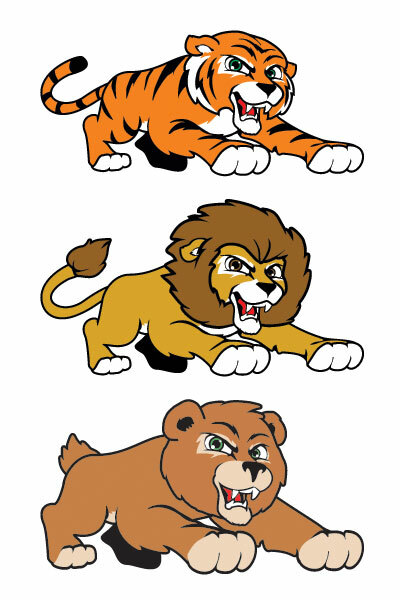 Each critter is ready to pounce into action for your school, although their favorite action is probably a fun romp in the field or maybe even a belly rub. See other mascot shirt designs here.